Nikki Haley, the U.S. ambassador to the United Nations, refused to say she was “confused” over contradicting messages the White House sent this week regarding the possibility of placing new sanctions on Russia. On Tuesday, Haley responded to Larry Kudlow — a conservative former CNBC host and the recently named director of the National Economic Council — who spoke about Haley during a press conference in Florida. Kudlow claimed Haley seemed confused when she announced last weekend that President Donald Trump would be hitting Russia with a new round of sanctions as punishment for the country’s refusal to help in the effort to stop Syria’s government from using chemical weapons on civilians. Kudlow reportedly later apologized to Haley personally for his remarks. Trump stated he had not made this decision at all, despite previous reports, and quickly became angry about the situation. The president also reportedly became frustrated after Haley began strongly condemning Russia on television for its interference in Ukraine. 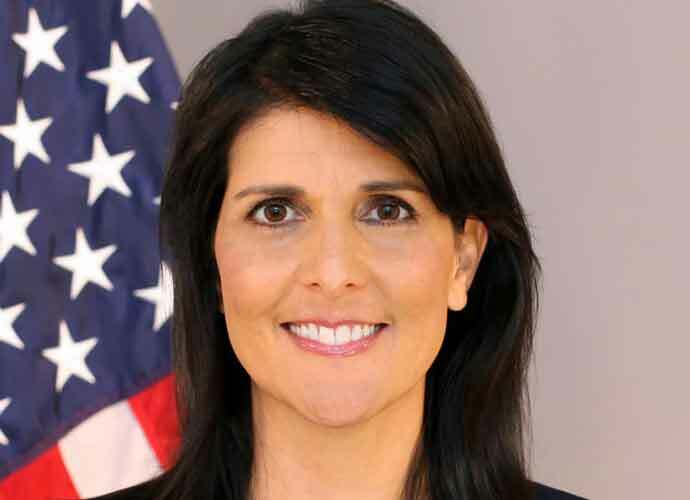 Haley has played a major role in shaping the Trump administration’s foreign policy ever since Rex Tillerson was ousted as secretary of state. Mike Pompeo, the former CIA director, has been named as Tillerson’s replacement but has not yet been confirmed by the Senate. Pompeo reportedly traveled to North Korea last week to meet with Kim Jong-Un and other officials to discuss the possibility of North Korea de-escalating its nuclear weapons program. National Security Adviser John Bolton, a former George W. Bush administration official and war hawk, will be key in help craft Trump’s foreign policy decisions. On Friday night, France and Great Britain joined the U.S. in launching airstrikes on Syria, which has been ravaged by civil war for more than six years. The decision came in the wake of a chemical attack that killed more than 40 people in Douma, a suburb of Damascus, earlier this month. Approximately 2,000 U.S. troops are currently in Syria to help fight the terrorist group ISIS. Some former government officials have stressed that the administration has to avoid sending mixed messages again in the future. Michael Wolff, a journalist who wrote the tell-all book Fire and Fury: Inside the Trump White House, said on a few television programs — including MSNBC’s Morning Joe and HBO’s Real Time with Bill Maher — that he had reason to believe Haley and Trump were having an affair because they spent significant amounts of time together. Wolff was kicked off Morning Joe earlier this year after he attempted to push the rumor.